Stone or concrete columns and pillars have a number of possible uses in hardscape design. 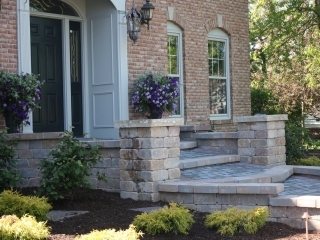 They can be added as an accent to many other hardscaping features, giving them a touch of classic elegance. For example, columns or pillars can be added to the ends of seat walls or retaining walls, placed at the edges of patios or porches, or used as supports for pergolas or shade structures. Columns and pillars also have practical uses, and can give structural support as well as visual appeal. We construct columns and pillars in a wide variety of colors, textures, and materials. Our Rockford staff can design columns and pillars that perfectly match or complement your home’s architectural style. Contact us today, and let us put our 10 years of design and construction experience to work for you.